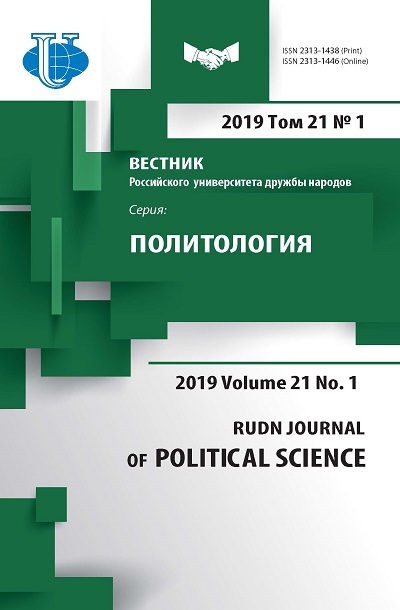 The journal publishes original articles and reviews in Russian and English of Russian and foreign authors on topics relevant to Political Science. The target audience of the journal are international political scientists and post-graduate students in the fields of political science and international relations. Members of the editorial board and leading global experts in corresponding areas of sciences, invited as independent readers, perform peer reviews. Editor-in-chief, deputy editor-in-chief or executive secretary choose readers for peer review. We aim to limit the review process to 4-6 weeks, though in some cases the schedule may be adjusted at the reviewer’s request. The scientific journal “Bulletin of Peoples` Friendship University of Russia. Series Political Science” published since 1999. The journal is published four issues per year. Edition of each issue is 500 paper copies. The information about all the articles published is archived in Russian Electronic Scientific Library (eLIBRARY.ru). The direct URL to the journal issues: http://elibrary.ru/contents.asp?titleid=9656. You can search through article metadata (title, author, keywords, abstract etc.) on eLIBRARY.ru. The URL to article’s full text is available on the article’s page on eLIBRARY.ru. The articles’ full texts are stored on the journal’s server and can be accessed through this page (http://journals.rudn.ru/political-science/issue/archive) or from each article's individual page on eLIBRARY.ru.